Strong hands grasp mine and help me step across onto the gleaming 65-foot white catamaran, her mast reaching for the noonday sun under a clear sky. I step out of the way as other excited guests join us on the boat while nearby, hotel guests are already playing in the shifting blues of the Caribbean Sea as the crew hands out ice cold water. The DJ starts the music, (classic dancehall versus the expected well-known Bob Marley tunes) as the engines roar to life and we begin to back away from the dock. The crew shows us the safety procedures and we’re off! 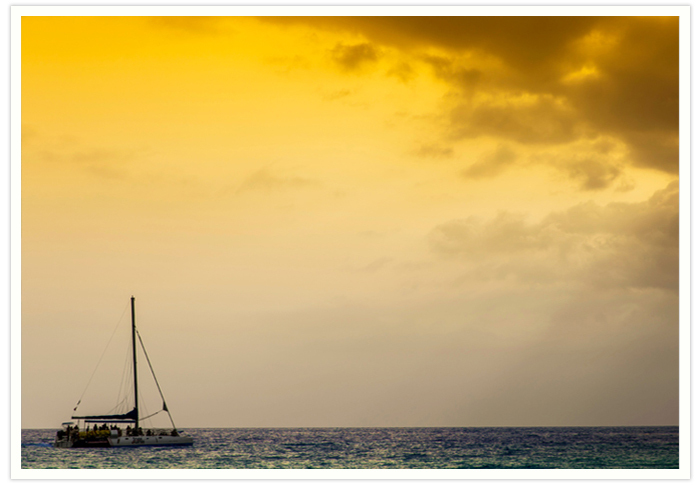 I had been a little torn at first about which Island Routes catamaran cruise to do. I had been tempted by the party cruise in Montego Bay, the iconic sunsets of Negril, and the South Coast, the new hotspot in Jamaica, with a tour to the world famous Pelican Bar, which is an Instagram worthy shack in the middle of the sea. 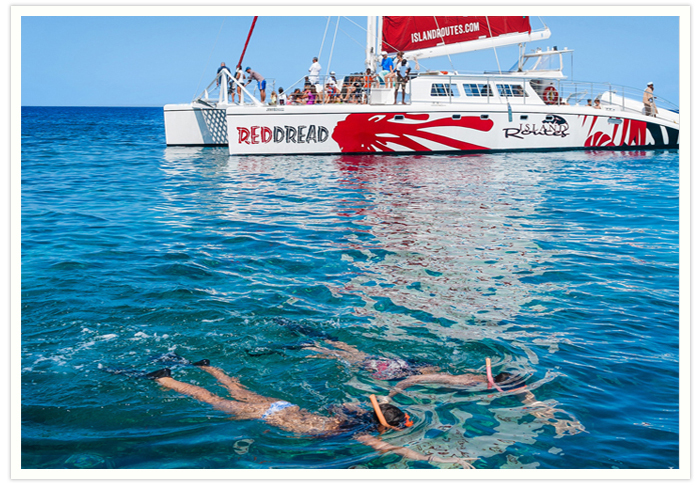 I picked the Dunn’s River Family Catamaran Cruise from Ocho Rios, which seemed the perfect combination of a party at sea, a chance to explore one of Jamaica’s top ten attractions plus a snorkeling lesson! Now, as we sweep along the stunning coastline and passengers wave to us from the cruise ship in port, I know Island Routes had helped me to pick the perfect cruise. The crew begin pointing out interesting landmarks while making sure everyone is comfortable and enjoying themselves. It’s a small group today, including two families and a group of friends chatting excitedly beside an older couple in their 70s, who all joined us from Beaches hotel. The crew begins handing out snorkeling gear for the first activity of the day as we approach the reef. A mini snorkeling lesson is given for those who have never done this before, while other members of the crew head for the water to guide everyone in their underwater adventure. I, of course, choose to enter with a splash using the fun mini slide built right into the boat! I am mesmerized by the beauty under the ocean, reluctant to leave but am reminded that Dunn’s River Falls awaits me! Our guides lead us back to the boat, everyone chatting excitedly and already sharing photos of what they managed to snap of the teeming underwater life. Soon we are pulling up to the dock at Dunn’s River Falls and everyone is putting on water shoes in anticipation of the climb. As we form a human chain, holding hands, shouts of ‘Yeah man!’ are encouraged by our enthusiastic guides. Strong bonds with complete strangers are instantly forged as we all laugh, complain and help each other up the stunning waterfalls. After a few queries along the way of “Are we there yet?” we triumphantly snap the obligatory photo by the ‘Congratulations You Made it!’ sign and make our way back down to the beach recapping the highlights. We head back out to sea as the food and drinks begin to flow and, after a delicious lunch, we all hit the dance floor. Those who opted out of snorkeling and tackling the falls now boogie with enthusiasm while the crew teaches the kids and the rest of us the latest Jamaican dancehall moves plus a few classics (YMCA anyone?). We spot the dock of Sandals Ochi hotel just as we’re all doing what is possibly the messiest conga line in history! Everyone is still laughing as we disembark waving fond farewells to the crew, who now feel like our best friends. 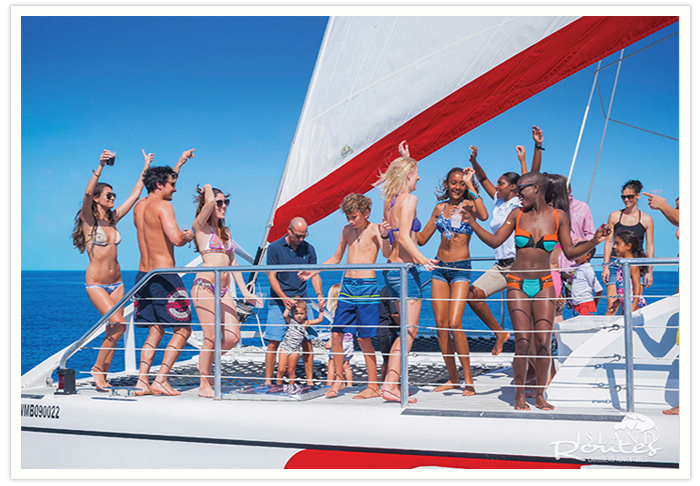 Since I’m staying at Sandals I decide to take the romance out to sea the next afternoon with the more laid back, adults only ‘Lover’s Rock’ Island Routes Catamaran cruise. It feels like going sailing with old friends now as the crew greets us with a warm welcome as we board. (And yes, Sade’s love anthem is a part of the playlist as we head out in the opposite direction from Dunn’s River Falls). 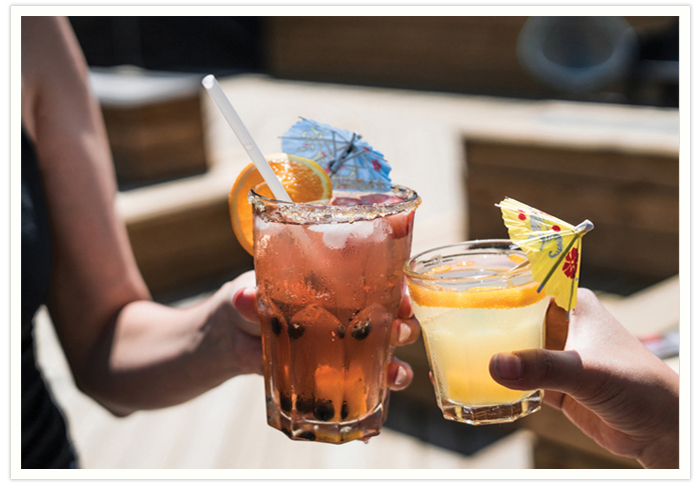 Our drinks in hand, this cruise feels more like a relaxed version of a cocktail party with music meant to help you just sit back and enjoy. We watch as the crew deftly unfurls the sails and tacks into the wind and we are told that hors-d'oeuvres will be served when we can walk around more easily. Apparently, they are usually served as we cast off. Not minding at all, I snuggle in, turning my face towards the sun, the wind blowing my hair back as a crew member magically appears and replaces my delicious rum punch. We end up anchoring in blue water that seems almost unreal, and we even spot a graceful manta ray passing us by. We snack and try to take in all the natural beauty around us and that’s when it happens; the sea begins to glisten and the sky starts taking on a golden hue. We head back into what seems like an endless sunset. Everyone taking as many photos as they can, trying desperately to capture the scope of it, as each moment seems more beautiful than the one before. The boat barely moves with the waves and everyone falls silent as we watch the sun call an end to our day. As I step onto the dock I realize that my curiosity has simply been piqued since I chose this cruise and the family Dunn’s River Cruise. What about the Island Routes Survivor themed cruise in Negril? That one sounded like a blast! I smile to myself and say that traveler’s mantra ‘There’s always next time’.